Why should you come to Andrew Palooza? Most of you don’t know Andrew Kristoff (most of you don’t actually know me!) so I would like to tell you about him. Andrew is 32 years old and lives in Maillardville in Coquitlam with his wife Theresa and their twin boys, Alex and Aaron. Andrew went to BCIT and became an electrician but hasn’t been able to work for some time now, I first met Andrew in 2001 and we have been friends ever since even though for the longest time he called me Steve (haha sorry Andy!) As time passed Andrew began to notice that he wasn’t able to do things as well as he used to and was soon diagnosed with MS. The disease progressed fairly quickly and for the most part Andrew is now forced to use a wheelchair to get around. One of my fondest memories, not just of Andrew but but from my entire life, was on a cruise for a friends wedding in 2007. Andrew wanted to go down the water slide so a few friends and I carried him up the stairs and fired him down the slide, his smile was totally worth it. Andrew and his dad pulled me aside at Alex and Aaron’s first birthday party and asked me if I could help them raise money for Andrew to get Liberation Treatment in Seattle. Having just raised over $4000 for Variety for Hayley’s first birthday I was honored that they would ask me to help. Recent studies have shown that MS in not a disease, it is a malformation of the veins that allow blood to drain away from the brain and back to the heart. The veins are too small so the blood doesn’t drain as quickly an the heart pumps it in and this causes iron deposits to form on the brain which turn into lesions which cause MS. Liberation treatment is a procedure which enlarges those veins allowing the blood to drain and lessening and in some cases reversing the effects of MS.
Andrew Palooza is what we’ve come up with to get him this treatment. Dale from Red Room Ultrabar, who knows Andrew and his family has been very generous by letting us have this event and keep all of the ticket proceeds. The Red Room holds 500 people at $20 a ticket that’s $10000 enough for the treatment plus a little extra to allow Theresa to take a couple weeks off to look after Andrew and the twins. Behind Sapphire, Bodhi Jones, Nadia Von Hahn and Sweetheart are all playing this show for free, Carmen Cruz is emceeing for free and we have some talented comedians, Ruven, Ryan Mutama, Al Hassam, Goldie Hoffman and Chris Gaskin to lighten the mood a little. We have received awesome graphic design for our logo and show poster from Rohit Tandon and lots of social media love trying to spread the word. So now the only thing left is to sell tickets. Please come and join us, meet Andrew in person and help change his life. Andrew can be a beacon for those suffering with MS that a better life is just over the horizon. Let’s show the Canadian medical system that this is a better solution than pumping patients full of medication. 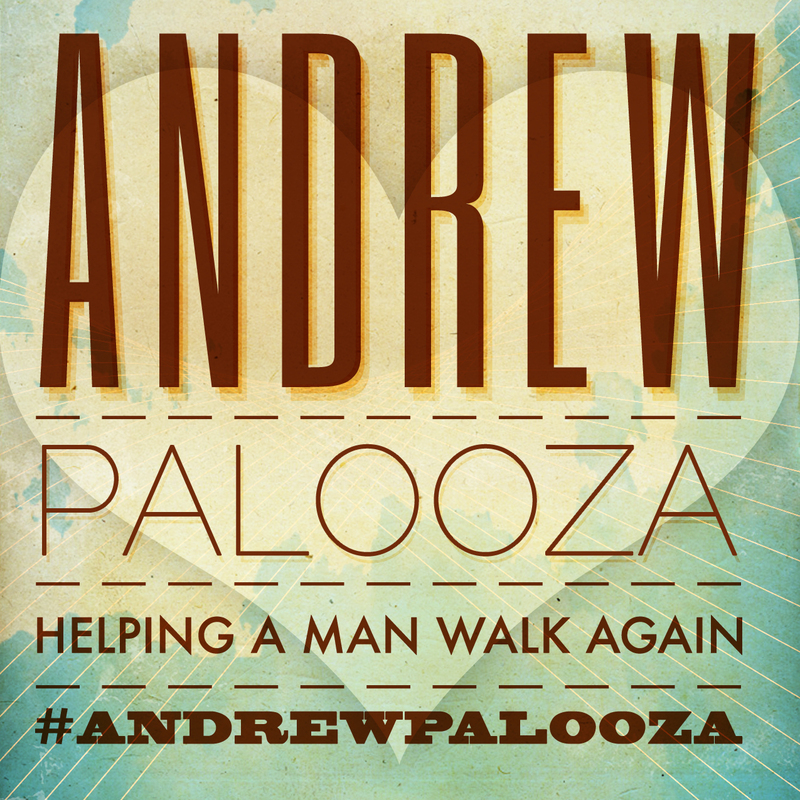 If you’re on Twitter use the hashtag #DoItForAndy or #AndrewPalooza for all Andrew Palooza related tweets. 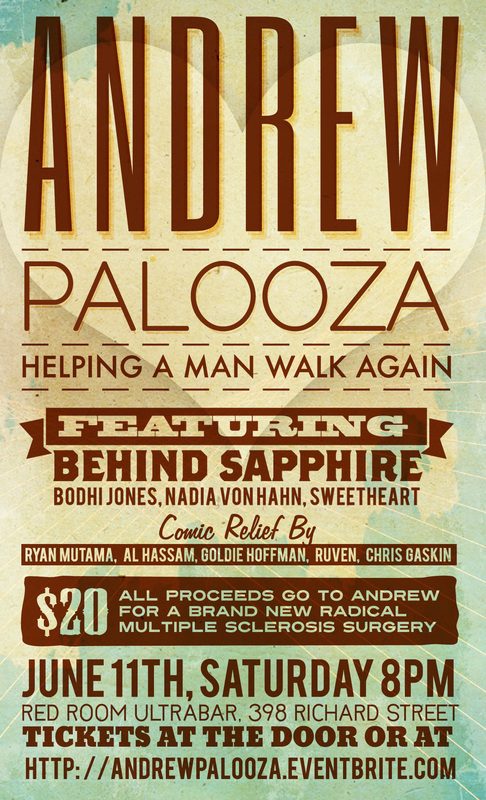 You can follow the event @AndrewPalooza. Please buy a ticket, invite your friends to do the same and come have a great night with amazing local music and good people. Music isn’t my usual subject matter but I do love it, maybe more than food (gasp!!). I made a last minute trip out to Abbotsford tonight to see Behind Sapphire, a Vancouver based pop/folk band. I met my pal Dylan and his wife there, yes the real More Than A Feeling music blogger himself! The venue was a little coffee shop called Go Go Beans who make a killer Americano, a very intimate setting to say the least. 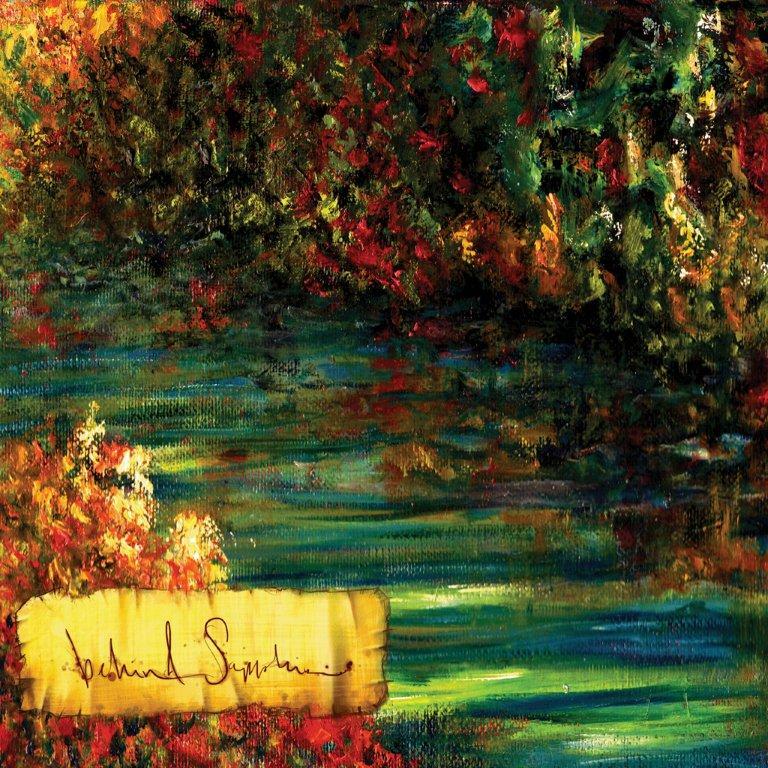 The band played a nice set starting with “Oh My, What A Fine Day” off of their self titled debut album, very beautiful song with haunting vocals and a great harmonies. The whole set was solid and finished with a fully unplugged performance of “Nearer My God to Thee” which sounded fantastic. It reminded me of seeing Fran Healy do a fully unplugged set at The Vogue last year. I kind of get the feeling that in the near future I’ll be telling people that I saw Behind Sapphire play at a coffee shop in Abbotsford and they won’t believe me. Great song writing and great story telling equal a great show. Thanks to VanCityAmy for posting their video a while back so I could discover them. I see big things in their future.